Bangalore restaurants- Food and Travel: I want to Eat!!!!! "I need to eat! 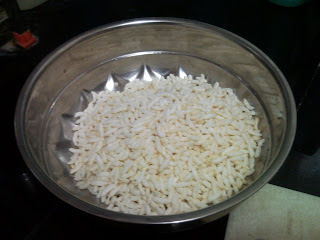 Make me some of that churmuri you make. "Post pregnancy Sudhakar had come to understand how lethal those four words meant. I NEED TO EAT! Dark memories of getting kicked out of bed at 3:00 in the morning sent a shiver down his spine. As he headed for the kitchen he was hoping for some way out...hoping she suddenly feels full again. "What is she going to be full with? Gas? ", he thought. He found a couple of onions. Tears ran down his cheeks as he chopped them fine. Tears of onions are tears of happiness, he said to himself. "CORNY!!" screamed his witty conscience. "I need something crunchy in there." The last time he had added some khara kaddis in it. Now there was no khara kaddi. He cheated. Crumbled some Nippatts into it. 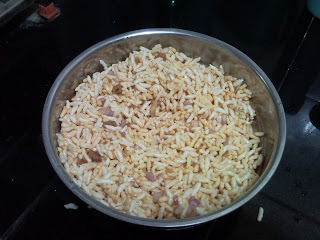 Now we add the puffed rice, oil, salt, chilli powder, turmeric, corriander powder... and mix. "What??!! No chaat masala?" his culinary conscience nearly chopped off his head. "No", he said reassuringly. "Trust me"
Stuck a couple of spoons into it and looked at his wife. "I WILL live to see another day", he thought to himself as he took the mixture to the living room. And he did.